I love going to the Beach. I have been doing it all of my life. I am very lucky to have been born and raised in a place like New York City. There is a lot to see and do. Everything is in a constant state of flux so things are always changing. New York is also near the ocean. 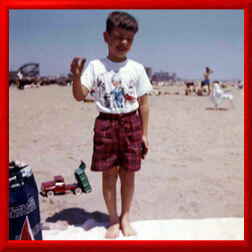 I grew up in Brooklyn, which has the beach of Coney Island on the South End. I have been going there since I was a baby. At first my parents took me here and in my teens I started going on my own. It is very relaxing after a long work week to just head to the beach, plop down to lay on my blanket and unwind while I enjoy the sun and the surf. Usually I bring a good book to read while I am there. In the June of 2005 I had graduated from Brooklyn College with a Bachelor of Science Degree in Business.That's my old friend and beach buddy Patricia in the background. In the photo above I am reading a book to prepare the GMAT test, which I had to take in the fall of 2005 as part of applying to MBA school. (I did get in) Go to the My Schools section to see where I got to school for my MBA.